Event Conferencing - Global TaNK Co., Ltd.
General telephone lines with proven reliability provide the core teleconferencing infrastructure. A web management tool ensures ample security by enabling organizers to check participation and lock out others. A phone and Internet access are all you need for easy teleconferencing or web conferencing. Any problems entering PIN numbers are resolved by automatically contacting an operator, who will admit participants. Optional features also encourage attendance, such as dial-out service for participants to join meetings. Settings for each PIN number can be customized to suit the type of conference. Other options include moderated and managed and facilitated conferencing experienced (operator-assisted conferencing and support in admitting and managing participants). These services can be combined as needed for the ultimate in support. MC (Facilitator Service) 50,000yen Supported by a dedicated operator, from managing admittance to facilitating proceedings. Managed Conferencing 50,000yen After participants state their name and join the meeting, an operator presents this information on the conference management screen. Local Access In Japan 50yen/connection Conferencing participants pay calling rates. Charges to connect to the access points will be billed to participants by their carrir. (incls calling rates) Service charges are borne by the organizer. 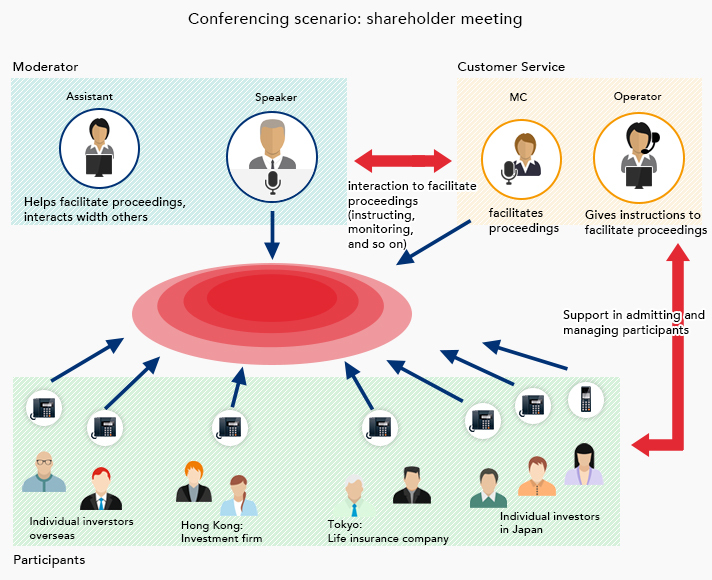 Web Conferencing - 18yen/connection Use of the console (conference management screen) is free of charge. Recording / CD Making 3,000yen/disk Provides a recording of conferences on CD. Conferences are recorded at no charge. Note: Discounts do not apply to optional services.